Google Chrome web browser does not provide an easy way to download and install an previous version or older version of Google Chrome. The setup installer of Chrome always installs the latest and newest version of Chrome, and to make matter worse, Google does not provide old version of Chrome for download too. If you really need to use an older version of Chrome web browser, you can try to download the setup installer from the following sites. If you’re not comfortable to download Chrome from non official sources, or the version of Chrome that you want is not available, you have to download the corresponding version of Chromium instead. Chrome is based on Chromium but Google adds a number of proprietary, closed-source bits to their Chrome browser that Chromium lacks. For example, AAC support, H.264 support, MP3 Support, Adobe Flash (PPAPI) plug-in, Google Update, extensions restricted to those hosted in the Chrome Web Store, Crash and Error Reporting and etc. Under “Tools”, identify the build version of a Chromium release in Version Information by entering the version number of Chrome that you want into the Version: text box and hit Lookup button. You can use Google Chrome history on filehippo.com to get the Chrome version available. Get the value for Branch Base Position from the output. Choose your platform: Mac, Win, Win_x64, Linux, Linux_x64 and more. Pick the Chromium build number you’d like to use. 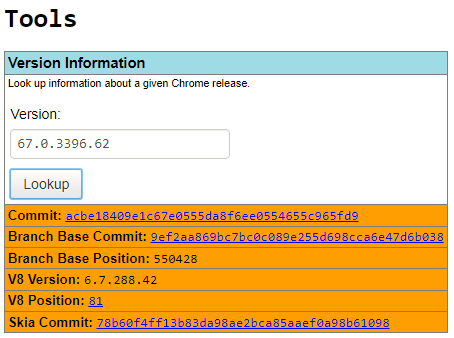 You can make use of filter to quickly locate the Chromium build at base position. Download the ZIP file (normally starting with chrome-) containing Chromium browser. Extract the executable inside the ZIP to install.